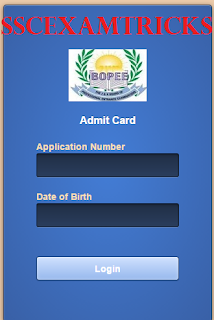 Jammu and Kashmir Board of Professional Entrance Examinations (BOPEE) had invited online applications from 17th of February to 11th March 2015 on official website www.jakbopee.org / www.jakbopee.net for getting admission in various professional courses (MBBS / BDS / BAMS / BUMS Physiotherapy / B.V.Sc. / B.Sc. Agricultural Courses / SKIMS Courses / BE / B.Tech and other professional courses in Government and Private Professional Institutions of the State through common entrance test (CET) which is scheduled to be held on 30th May 2015 & 31st May 2015 at various centres in all over the state. A huge numbers of candidates are going to appear in this entrance test and waiting for their online admit cards. The latest news is that JKCET EXAM 2015 Admit Cards has released on official website which can be downloaded by candidates. The candidates are required to login their account by entering Application Number, Password, Security keys (which is displayed on the screen) and pressing submit button in the end. Those candidates who have applied for this entrance examination for admission and waiting for admit cards can download their admit card on the direct link provided below. · Enter Application number & password. 6. Note down Room No., Floor and Seat no. of the back side of the Admit Card page. The JKCET EXAM 2015 will be conducted on 30th May 2015 & 31st May 2015 by Pen MODE. In Pen Mode, the exam will be entertained through filling of circles on Computer Generated Page known as OMR Sheet containing information of answers which will be selected by filling circle in it. This OMR sheet will be filled by Blue/Black ball point pen. The exam will consist of various papers containing questions of Physics & Chemistry (Common Paper), Mathematics and Biology (Botany, Zoology). Physics & Chemistry will be a Common Paper containing 200 questions for a time duration of 2 hours. Other section will be of 60 questions which is required to be done within 1 hour i.e. 60 minutes. The exam will be a multiple choice question paper in which four options are provided out of which candidates need to choose one correct answer. There will be 0.20 negative marking for any wrong answer.